So Cute You'll Be Tempted to Smooch One! We just can't promise it will turn into prince! Frog beanbags in 6 different colors. Durable and washable vinyl fabric outer layer. Stuffed with a combination of polyfil and sand. We can't guarantee it will turn into a prince if you kiss them, but it's so cute you might be tempted to try! Set of frog beanbags in 6 different colors, each made with a durable and washable vinyl fabric outer layer. Stuffed with a combination of polyfil and sand. The eyes are silk-screened onto the frogs, so there is no chance of them falling off. Approx. 5-3/4" x 4-1/4". 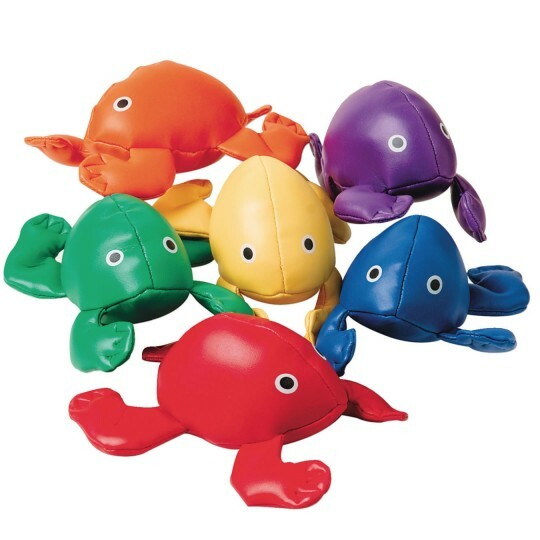 our go-to for beanbag frogs! We use it at a large educational facility for jungle games. They are used in a catching game. We've used the last set for several years with use by over 1500 students. We just bought new ones to refresh. I used these frogs for a field day event and they provided a lot of competition in a memory game. Fun and easy to clean up after a child has touched them with yucky fingers.